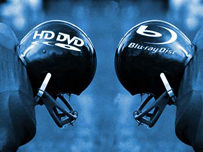 The HD-DVD Promotion Group has shelved its CES conference plans following Warner’s decision to drop HD-DVD support in favor of exclusive Blu-ray distribution. "Based on the timing of the Warner Home Video announcement today, we have decided to postpone our CES 2008 press conference,” read a statement from the organization. "We are currently discussing the potential impact of this announcement with the other HD-DVD partner companies and evaluating next steps. We believe the consumer continues to benefit from HD-DVD's commitment to quality and affordability – a bar that is critical for the mainstream success of any format." Warner previously announced that its new focus on exclusive Blu-ray distribution "… will further the potential for mass market success and ultimately benefit retailers, producers, and most importantly, consumers," reports MCV. "The window of opportunity for high-definition DVD could be missed if format confusion continues to linger,” chairman and CEO Barry Meyer reasoned.